As readers may perhaps have heard, the BBC has partially upheld a complaint made by a Hamas-linked anti-Israel lobbying group relating to a BBC News interview with Jonathan Sacerdoti of the Institute for Middle Eastern Democracy which took place on November 14th 2012. 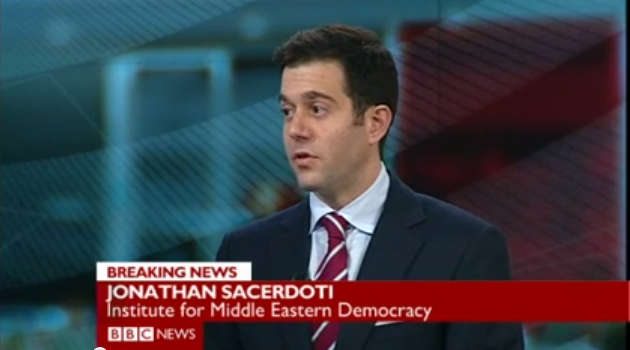 “Mr Sacerdoti was described by the BBC as a member of the Institute for Middle Eastern Democracy, an independent think-tank. But the Palestine Solidarity Campaign complained that the corporation should have mentioned he was also a former director of the Zionist Federation, and to indicate his “strongly Zionist” perspective. A PSC spokesperson said the group “wrote to the BBC to ask why it was misleading viewers by presenting Sacerdoti as being a neutral expert on Israel and Palestine, when he is, in fact, strongly Zionist.”. In light of this renewed ECU commitment to existing editorial guidelines, we can apparently henceforth look forward to the BBC’s “summarising the standpoint” of interviewees from ACRI, Peace Now, Emek Shaveh, Gisha, Addameer, the Land Research Centre, ICHAD, Machsom Watch and Adalah – to name but a few. We also anticipate hearing the BBC’s summary of the “standpoint” of representatives from Conflicts Forum, the ISM, the Stop the War Coalition and other organisations, as well as those of Electronic Intifada, +972 Magazine and of course the BBC favourite, Gilad Atzmon. 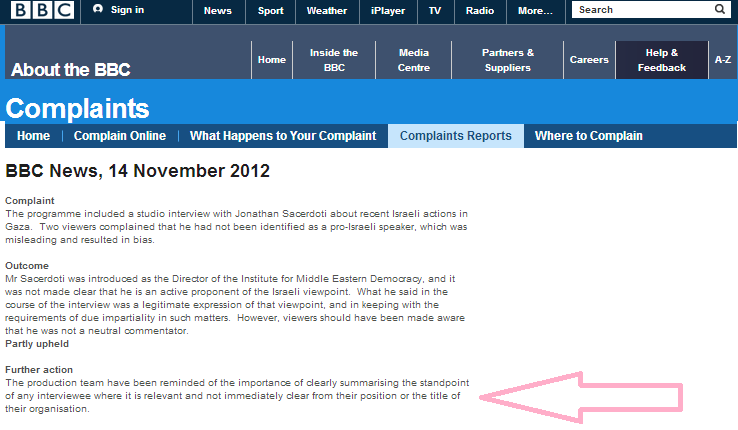 Likewise, it will no doubt be of considerable interest to BBC audiences to hear the corporation’s summary of the “standpoint” of leaders of the Palestine Solidarity Campaign itself because – after all – this ECU ruling underscores existing editorial guidelines designed to apply to all BBC platforms and all interviewees – not just those perceived as having a specific stance. Who has the ear of ‘senior BBC executives’? And will the BBC use the adjective “left wing” as often as it’s sure to use the adjective “right wing”? Since, as Peter Sissons not so long ago reminded us (http://www.dailymail.co.uk/news/article-1349506/Left-wing-bias-Its-written-BBCs-DNA-says-Peter-Sissons.html), the BBC’s very “mindset” is leftist, left wing viewpoints are likely to be regarded as normal, mainstream, central, and accordingly not worthy of noting. I look forward to their adequately informative labelling of their old mate Bari (Atwan).